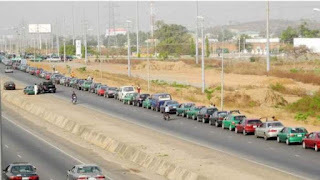 Motorists and travellers have been groaning in pains in the last two weeks over persistent fuel scarcity across the country. The NNPC spokesman, Ndu Ughamadu, said on Saturday in a statement that already, six major marketers, namely, Total, Forte Oil, Oando Plc, MRS, 11 Plc and NIPCO Plc, were loading products round the clock from their various depots in Lagos for onward trucking to other parts of the country. “The supplies are mostly from cargoes of PMS imported by NNPC which are daily berthing, and immediately being made to discharge their products to stem the supply hiccups. “The imported products are also being supplemented by supplies from the local refineries. “NNPC assures Nigerians to remain calm and not to engage in panic buying as the end of the challenge is nigh. “Marketers are strongly advised against hoarding as security agencies, working with industry regulators, will mete out appropriate sanctions to defaulters,” Mr. Ughamadu said. The NNPC Group Managing Director, Maikanti Baru, had earlier in the week, said the corporation’s one billion litres of PMS cargo imports had started to arrive.